"Looking Forward to 2012 - How Might Investment Trusts Perform in the Year Ahead?" 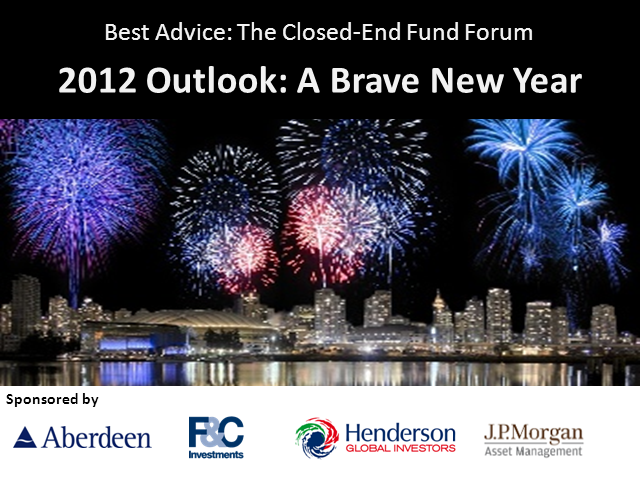 Hear from a panel of experts as they look at how Closed-end Funds (or Investment Trusts) might fare in 2012, demystifying these funds and sharing valuable insights on how they coped with the difficult conditions that faced investors in 2011. They will be discussing the likely influences on performance as the year progresses, how investor appetite is shaping up and if the fact that wealth managers are more likely to use closed-end funds than IFAs gives them an edge. The panelists will also discuss whether, under RDR, Investment Trusts are a better option for advisers than alternatives, such as open-ended funds. - Jeremy Tigue, F&C Investments.